Choosing Joy: Rhett is SEVEN months old. Rhett is SEVEN months old. Rhett is SEVEN months old. How can it be?!? --Rhett weighed 15.3 lbs at the dr two weeks ago. I am guessing he is pushing 16 lbs now. He has out grown all of the 0-3 month clothes finally, ha. We are in mostly 3-6 month stuff, if they have feet they have to be 6-9 months for length. --I was devastated to put him on formula a month ago, but since doing so, my life has gotten SO much easier. He eats 4 bottles a day. An 8 oz bottle around 6 am, baby food around 8, a 6 oz bottle at 9:30, nap from 10-12, 6 oz bottle at 12:30, nap from 2-3, baby food at 4 followed by a bath, then a 6 oz bottle between 5-6pm and usually down for the night by 6:30! --We have to use the spit up formula, which is quite pricey, so I recently have been just using the Similac Sensitive with 1 tbsp of Rice Cereal added and it seems to do the trick. --He is in size 2 diapers, but mostly cloth. He had a reaction to Huggies the other day which makes me even happier we are using cloth. 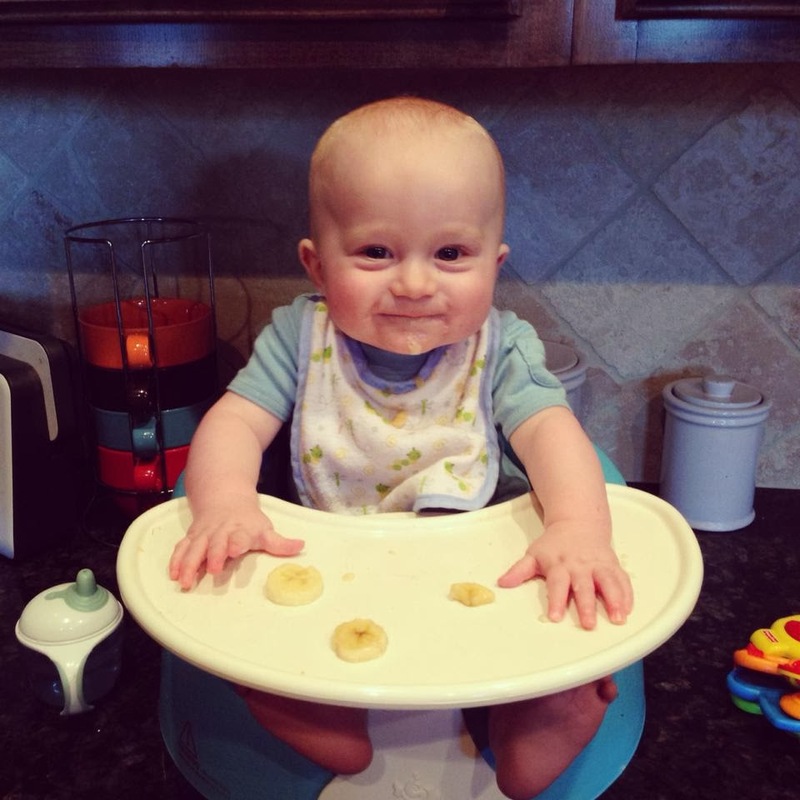 --So far his favorite foods are bananas and sweet potatoes. He tolerates peas. He doesn't care for carrots or mixed veggies or blueberry yogurt. I make him oatmeal every morning with bananas and he gets veggies in the evening. I have recently started giving him the rice cups and he LOVES those because he can do it himself. --No teeth yet, but I am convinced one will be coming in soon. --I just moved him into his crib at night last week and since doing that he has been sleeping 12 hours at night, I guess I should have done it sooner! He sleeps in his sleep sack, but I've started letting him sleep with his blanket (THIS aden and anais dream blanket, I am obsessed). --He is sitting up great and pulling up when we hold his hands. He is also getting on all 4s and trying to crawl, I am NOT ready for that! Rhett Joseph, you are still just the happiest and sweetest baby on the planet.